There are many golfers who are unaware that their mental approach is blocking their true potential. All shots first begin in the mind after a player assesses a shot and decides what to focus on. These thoughts determine how a player feels and how well they swing the club in reference to their ability. Your mental game either helps your body make a good swing or it creates interference that causes errant shots and big numbers. 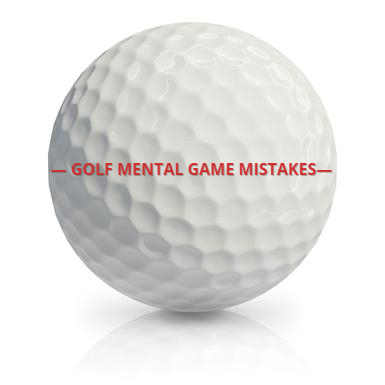 Below are the three most common mental game mistakes made by golfers today. The next time you play become observant and see if you can notice any of these. Many golfers have a negative attitude and focus on things that are unnecessary or unhelpful. A focus on the negative also makes the game less enjoyable for all involved. This is witnessed when a player focuses on where to NOT hit the ball, talking about the aspects of the course they don’t like and by doubting their ability to hit a good shot. This kind of thinking lowers a players confidence, puts doubt in their mind or introduces an undesirable target. Complaining is also a hidden form of a negative attitude. The speed of play, the course surfaces and the weather are never perfect but there are many players that like to focus on what is wrong instead of what is right. Solution: You can develop a positive attitude by only focusing on what you want to achieve or what you can influence. Talk about what you like, remember times when you were successful and discuss the aspects of the day that are enjoyable. This mental error refers to the way a golfer focuses and programs their mind before they play a shot. Many players swing the club without considering and deciding upon a clear and precise target. Some golfers program their mind with what they don’t want to do or even talk about what they did wrong last week. They then show great skill and manage to execute in the way they just discussed. Solution: Program your mind and body with a good pre-shot routine and think about what you want to accomplish. Analyse the environmental factors that will influence the shot, have a clear target and decide how the ball will get there. Then visualise the shot in your mind and feel the swing required to send the ball to your target. Many golfers have a score conscious mentality while they play. This causes emotional shifts that affect the way they swing the club. When a player focuses on their score, their mind is no longer in the present moment. They are either lamenting in the past over a missed opportunity or are anticipating the meaning of their potential score. The added meaning often makes it harder to execute well. A putt for birdie will usually make a player more nervous than a putt for bogey. A score focus often interferes with a golfers ability to execute well on the course. This reduces a players concentration abilities and generates emotions that are incompatible with good execution. It is not uncommon to hear about a golfer getting off to a good start and then dropping shots when they begin to think about their score. Solution: Focus on the process of each shot rather than your score. Keep your mind present by avoiding thoughts about the way you are playing. Keep the game simple by stating basic objectives like, hit the fairway or maintain good rhythm. Stay focused and aim to keep your emotions relaxed and balanced. Remember that there will be plenty of time later to add up your score and see how you went.